A closer look at the zinc monument of Katie McCarty portrays an innocent young child in image and word. 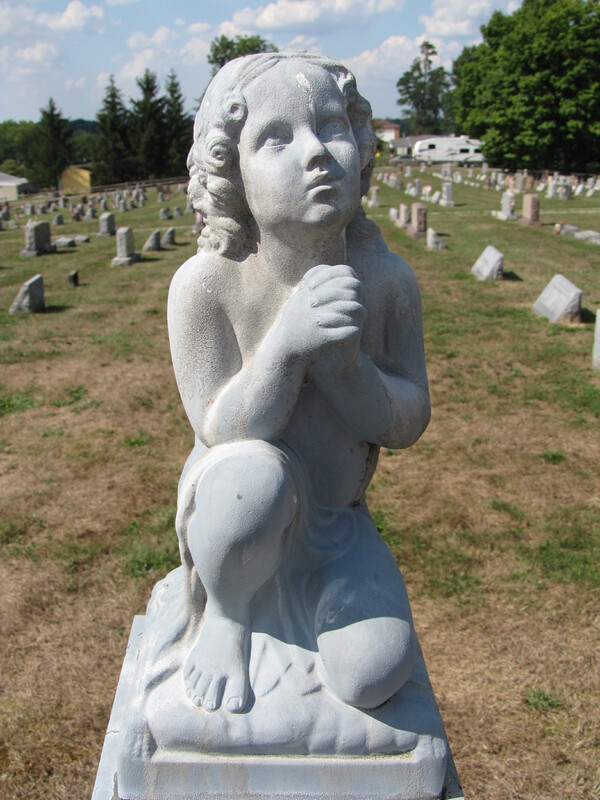 The statue depicts a young child sitting on a pillow, looking upward to Heaven in prayer. The epitaphs on the two side panels and the back panel speak to her young age at the time of her death, referring to her as a child, a cherub, and a floweret. SLEEP ON, MY SWEET ONE! TO HEAVEN A CHERUB BORN. THAT SO OFT ON US SMILED. AND BADE THE FLOWERET DIE. This entry was posted in Epitaphs, Materials. Bookmark the permalink.